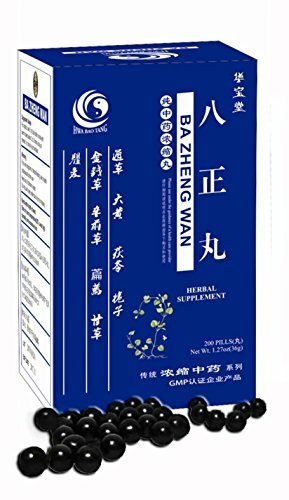 Ba Zheng Wan is a Chinese Medicinal Formula that has been used historically to help maintain proper urinary health. Ba Zheng Wan helps to remove excessive DAMPNESS (Sensation of incomplete voiding, dribbling, lower abdominal bloat, etc) and HEAT (Burning, urgent & frequent urination, discomfort while urinating, dark colored, foul odor, etc) from the Urinary Bladder meridian. 200 teapills per bottle. Contains: Shi Wei, Da Huang, Fu Ling, Zhi Zi, Jin Qian Cao, Che Qian Zi, Bian Xu, Gan Cao, Qu Mai. This formula does contain rhubarb. NOTE: This statement has not been evaluated by the Food and Drug Administration. This product is not intended to diagnose, treat, cure, or prevent any disease. Please submit any questions regarding the specific use of this formula. Made according to Traditional Chinese Medicine standards. Superior quality herbs. No pharmaceuticals or dyes. Unsulfured, preservative-free herbs. Microbial and heavy metal tested. 5:1 concentration. 200 pills per bottle. View More In Urinary Tract Infection Treatments. If you have any questions about this product by Hwa Bao Tang, contact us by completing and submitting the form below. If you are looking for a specif part number, please include it with your message. Biotics Research UT Complex– Chrysanthemum, Couch Grass, Cornsilk, Zhu Ling and Buchu Extract, Urinary Tract Support, Kidney Function, Renal Health. 90 Capsules.